Many people see WordPress as a CMS that was designed for bloggers but in reality, you can do much more with WordPress. Which is why many businesses have chosen WordPress to power their stores, catalogs and business pages. Of course for this to work, WordPress needs to be customized so that it looks a little more professional. To help, I’ve decided to put together this list of some of the most professional looking business themes that I could find online. 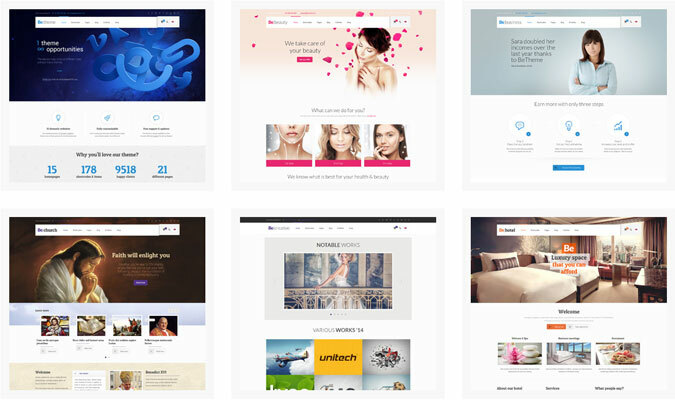 The list includes free and premium themes in a wide range of categories. For some businesses a simple clean look is all that is needed and the Skeleton theme delivers all of this while making use of responsive web design which instantly turns any website into a mobile friendly website. Path offers a professional looking light blue grid background with red accents that is sure to give any website a nice welcoming feel that will not overwhelm. 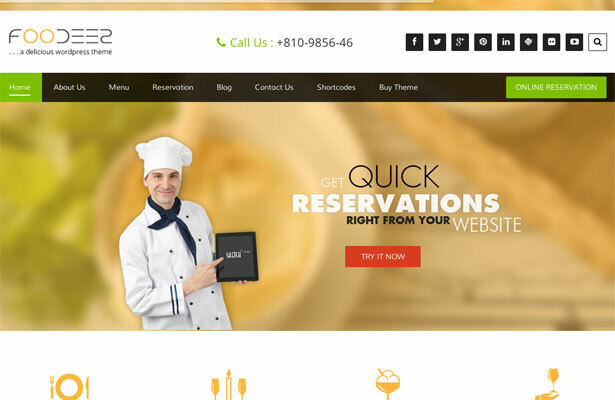 The theme features 5 widget areas, 3 menu locations and 9 page templates. 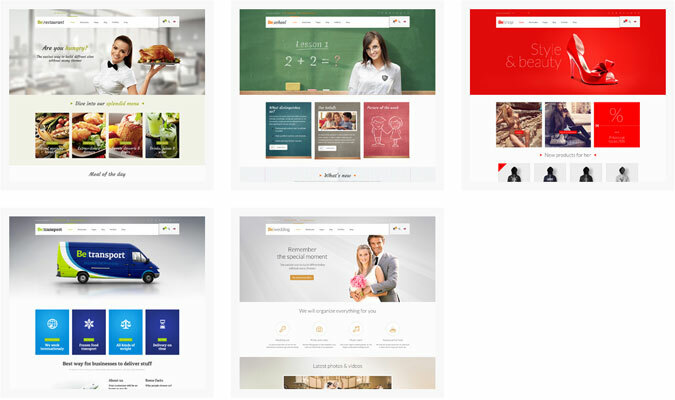 With over 15 designs to choose from, BeTheme can work with many different types of businesses. When you look at these themes, you will immediately see that the designers weren’t sacrificing quality over quantity. 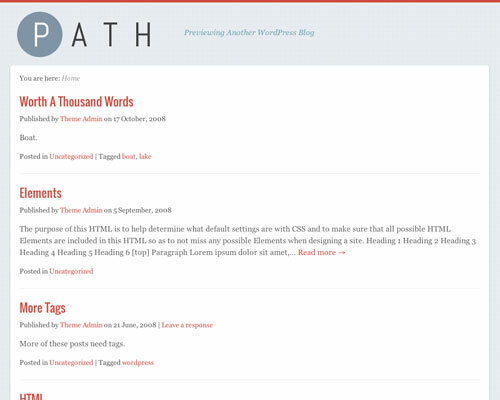 Instead each theme looks as good if not better than some of the themes that are sold individually on the web. In addition to that, there are also many additional features such as a 1-click skin generator and page builder which can help you create additional designs quickly and easily. 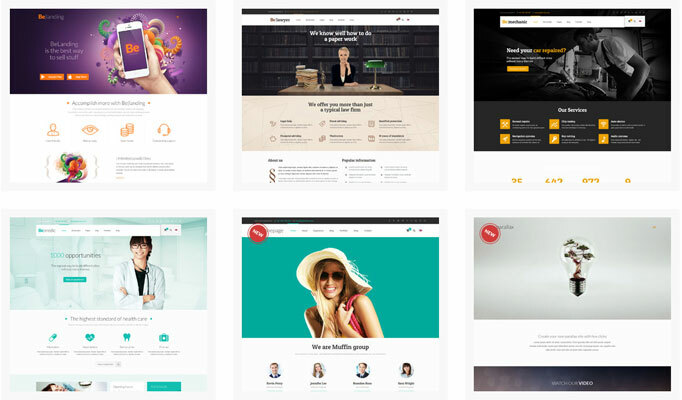 BeTheme includes predesigned templates for general business, beauty, hotels, law, medical offices, restaurants, schools, transporters, wedding related businesses and more. PepBiz provides a professional look burgundy, white and charcoal design. The theme is compatible with all major web browsers, is mobile friendly and lets you add social networking links through the admin panel. 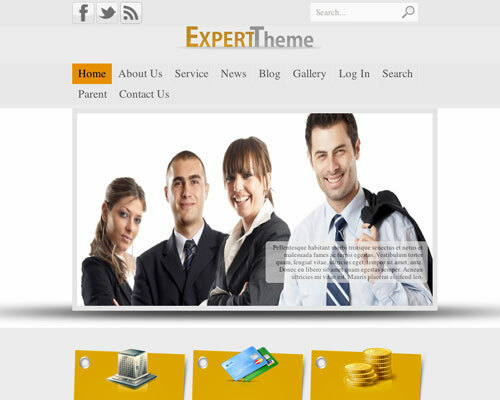 Expert theme features a nice gray design with gold accents which give it a nice solid, worthy feel. The free version is SEO friendly; lets you add social sharing buttons, custom favicon and logo, custom CSS and more. With a nice cool blue layout, this theme will be sure to give your site a nice professional, modern look and feel. The theme also incorporates modern features and design, includes social buttons, a featured slider, menu alignment options, custom logo options and more. 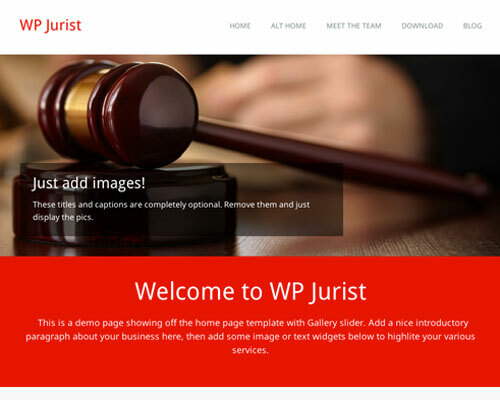 WP Jurist features a bright red and white design. 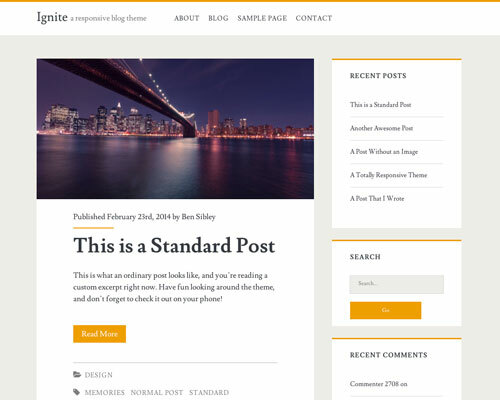 While the theme is free, it comes with many professional features such as: the ability to add staff profiles, comes with a large image slider for the homepage, offers a way to add an author bio at the bottom of posts and more. 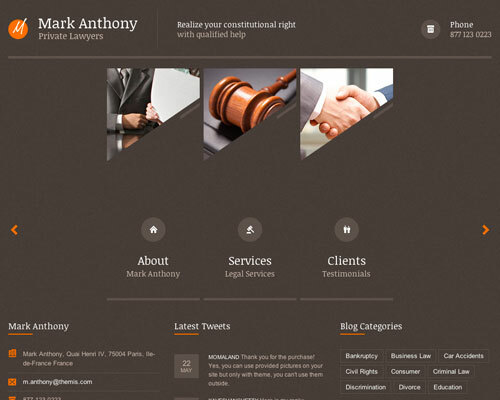 The Lawyer theme is modern, professional looking, bright and has a nice welcoming feel to it. Extra features are also included, such as: the ability to customize the theme with different backgrounds, logos, icons, images, colors; it’s multilingual ready; includes a revolution slider and many other things. 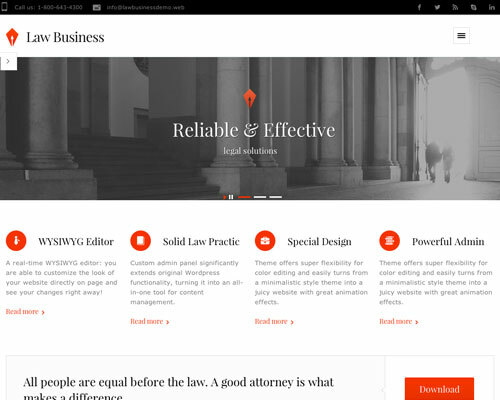 Themis Law offers a nice professional, traditional look with nice modern touches such as the uniquely shaped images that are used for the image slider, latest Tweets column, social network buttons and more. 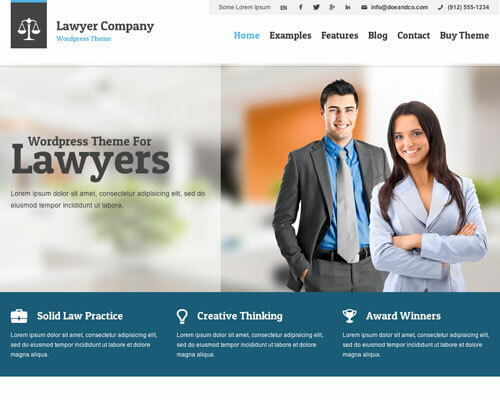 Law Business is Retina ready, lets you add a custom background, comes with custom widgets, features a drag n drop content composer, features an image slider, comes with advanced SEO features and much more. 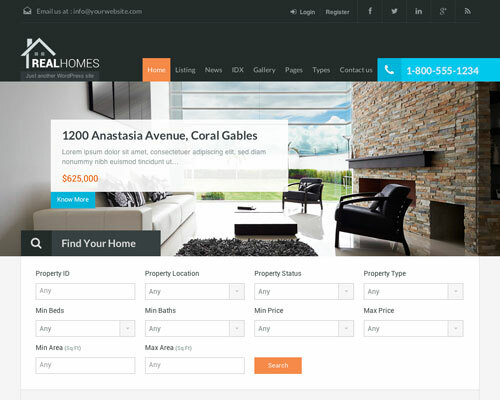 Modern Estate utilizes HTML5, CSS3; allows you to choose from various color schemes and page templates; lets you add agent profiles, property listings and more. I am usually not too fond of dark themes but RealWord does a nice job of incorporating a gray grainy background with black navigation bar. The theme also provides multi-layer navigation; different layouts to choose from such as a stretched layout, page with right sidebar, contacts page and more. Perfect for any Real Estate business page. Real Homes is one of the best selling real estate themes on the web and there is a good reason for this. 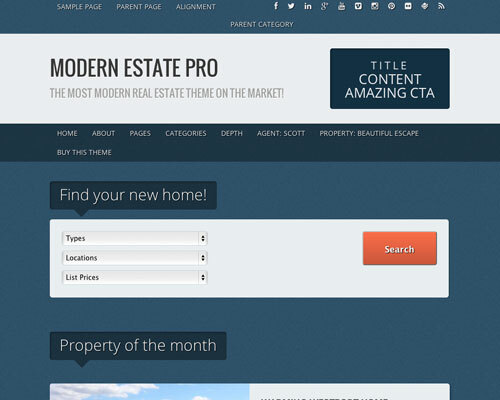 The theme offers advanced functions such as: the ability to add additional property details, has a property search engine, supports images and video, offers PayPal payments integration, lets users choose between simple and grid layout on property listing pages, lets users register and login to the site and more. Apartments has a nice let’s build a home look in feel to it and it functions great. With Google maps shortcodes, a social share bar, custom widgets and slider, dynamic content loader and more, the theme is ready to take your business to the next level. 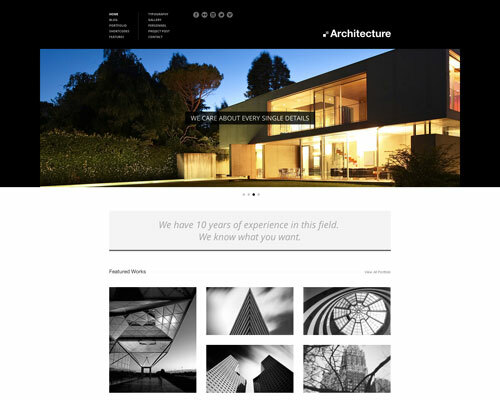 Solid Structure has a creative embossed design to it that gives it a nice developer look and feel. The image slider also has an area for text which make it user friendly as well as search engine friendly. There are also various page layouts that you can choose from, has built in Google maps support and more. 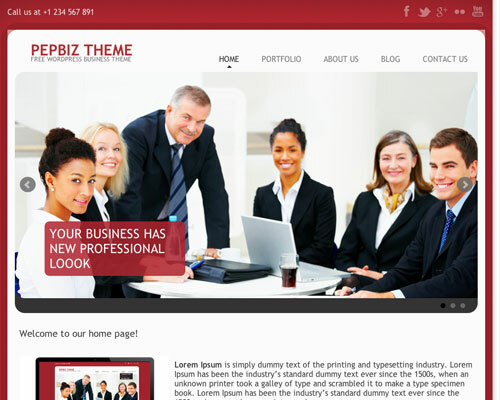 A beautiful black and white theme which provides a professional look and comes with many professional features. These features include a drag and drop page builder, advanced admin panel which is used for theme customization, support for images and video, price tables and more. 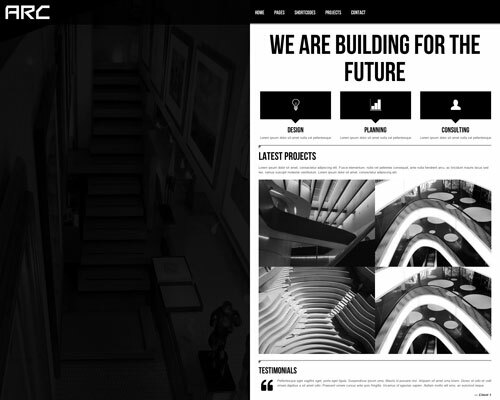 ARC has a unique 2 column homepage which features a fade in and out image slideshow on the left. The theme also supports video, is ready to be translated in other languages using .mo files, features an animated sidebar & menu, comes with a widget for Flickr images, is built on CSS3, HTML5 and more. Home box: which is like the one in the image above. Home fancy: which features a also lets you upload a background image but features a different layout for the navigational links. Home video: which lets you upload a video for the background. 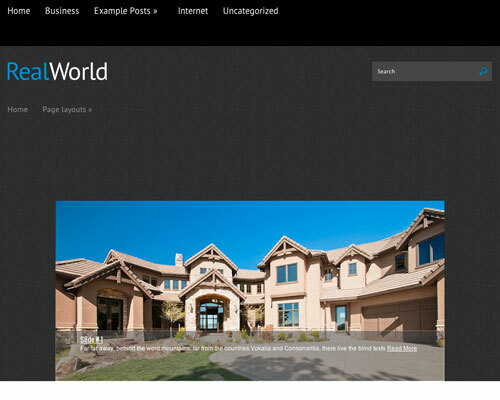 Home big: which lets you upload large images for the background slideshow and features a unique design for links displayed within the slideshow. 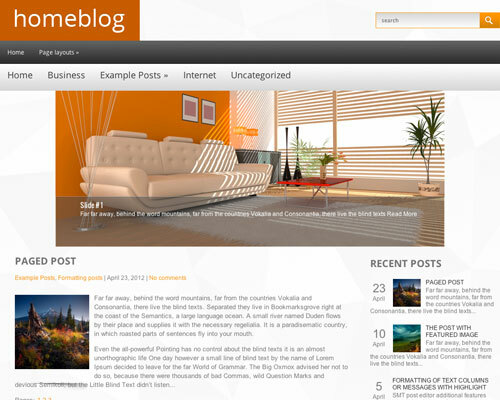 Home blog provides a nice clean, refreshing contemporary look with its orange, gradient gray and white color combination. 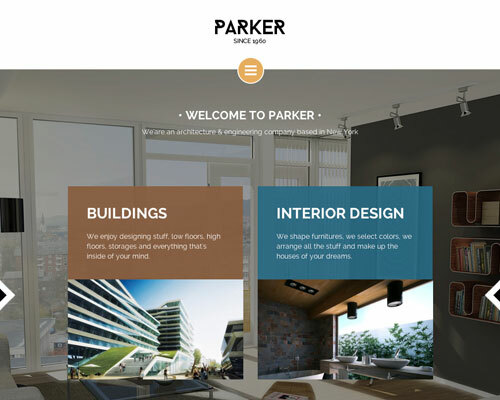 The theme is sure to make your interior design website look professional and ready for business. The theme also features infinite scroll, an image slideshow with raised edges, different page layouts to choose from and more. Ignite will be sure to compliment any photography website with its beautiful wide image layout that is perfectly positioned above each post. The subtle colors used in the theme also aid in keeping the viewers focus were it is best suited. 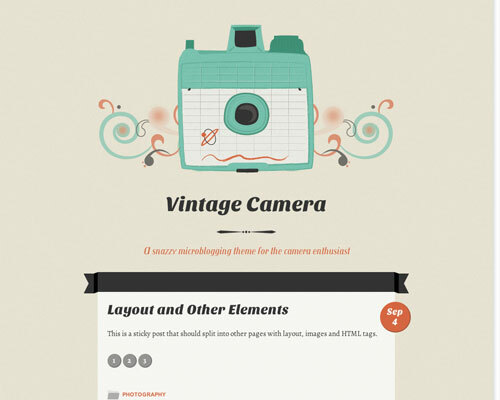 Vintage camera features a nice classic professional look with beautiful artwork that is sure to give your site a nice galleria feel. 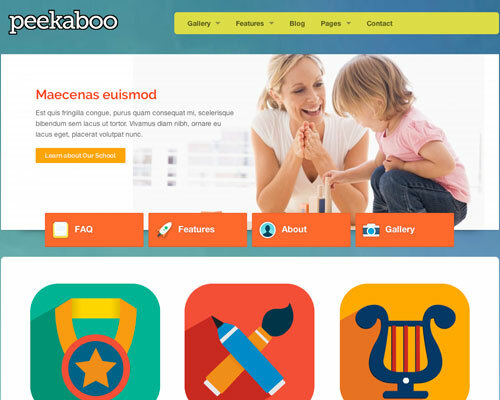 The theme also lets you choose from six different styles — each style features unique artwork and color combinations. 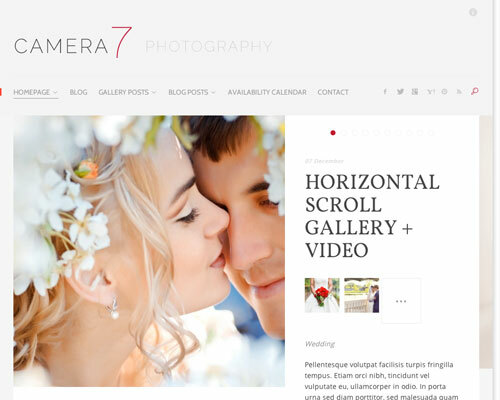 Camera 7 is built using HTML5 and CSS3. Is SEO friendly, user friendly, cross browser compatible, translation ready using .mo or .po files and the layout is great for wedding photographer website. 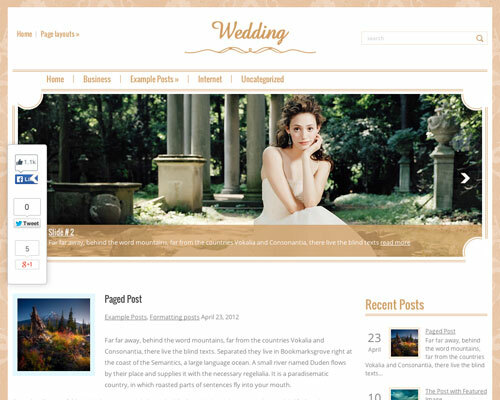 Wedding features either a wide column or 2 column layout. 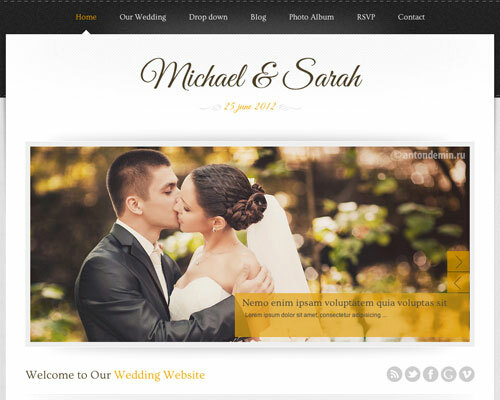 The theme has a nice vintage look that will make any wedding business site look both professional and elegant at the same time. Marriage has support for fluid images and videos, custom widgets, uses different CSS stylesheets based on browser size, jQuery drop down menus, full width page layout, cross browser support and more. Sweetly is Retina ready, has cross browser support, automatically resizes images, has multiple layout options which lets you choose between a right or left positioned column, features a camera slider and more. 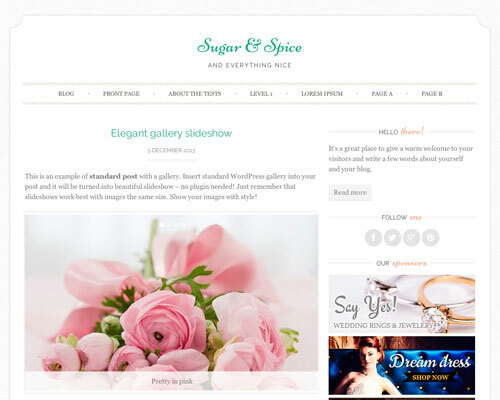 Sugar & Spice features a clean, elegant design that is sure to make your customers feel all warm & cuddly inside. The theme lets you choose from 10 color schemes, has 3 layouts to choose from, a slideshow gallery, has cross browser support and more. 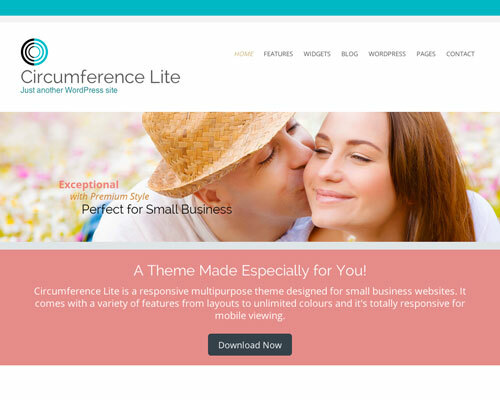 Circumference Lite features a beautiful pastel color scheme, includes 4 page templates, multiple post formats, 2 page widths to choose from and more. Pachyderm features a cartoon like design with different animal drawings and fun color scheme. 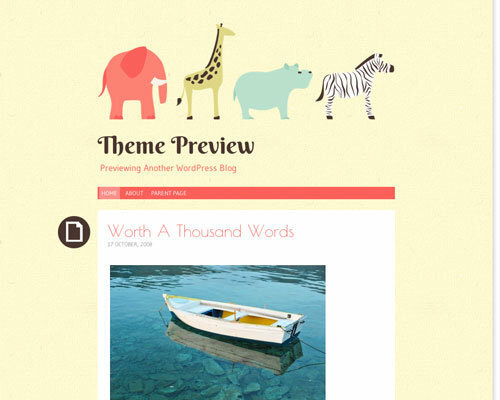 The theme features a one column layout and lets you upload your own background image. Peekaboo is built using CSS3 and HTML5, lets you upload custom background images, features responsive video support for YouTube & Vimeo videos, has support for Google maps, uses breadcrumb navigation, Google fonts integration and more. 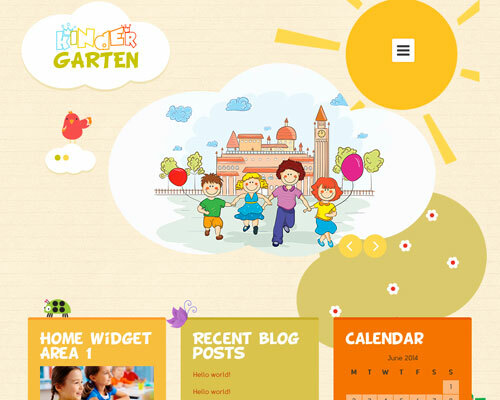 Kindergarten provides a professional looking cartoon design which is perfect for teachers, daycare centers, preschools and more. The theme is retina ready; features an image slider which automatically turns any uploaded image into the shape of a cloud; supports Google maps, social media buttons and more. 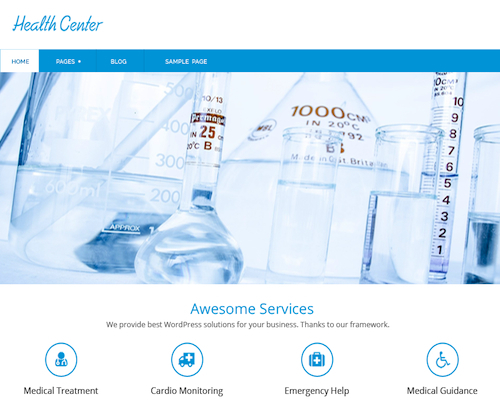 A great free theme for hospitals, medical centers, health care businesses or any other medical related business for that matter. 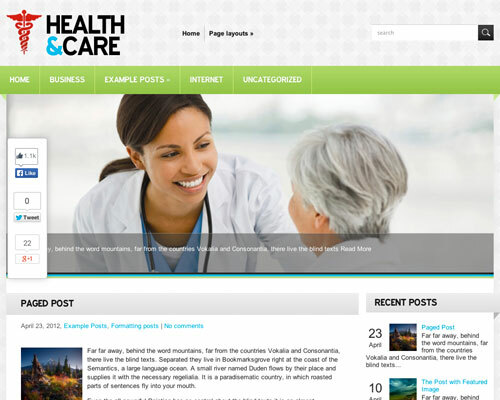 Health & Care features a professional layout that will give any website a nice modern feel. The features a homepage slider, pattern background, infinite scroll and many other popular features that are highly sought after these days. 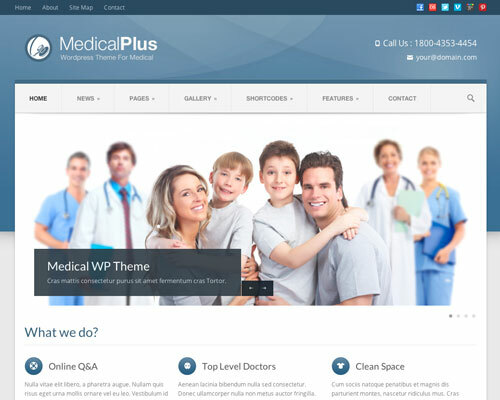 Medical Plus comes with 5 predefined background patterns; live color changer; a custom page builder which lets you choose how content is displayed; image, video or slider thumbnails and more. 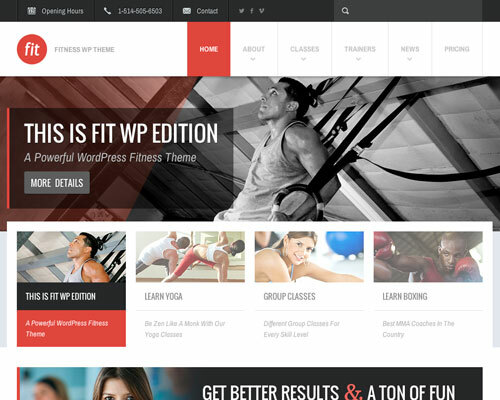 Personal Trainer features a cool green and white color combination that is perfect for heath or fitness related websites. 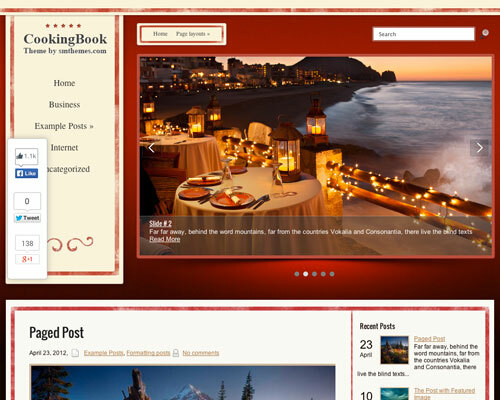 The theme was designed so that it’s search engine friendly and user friendly. FIT is a well thought through fitness theme that lets you add posts for each of the trainers in your gym. In these posts you can include contact and quote links. In addition to that, you can even create posts for classes where you can add a difficulty level meter with the values low, medium or high. 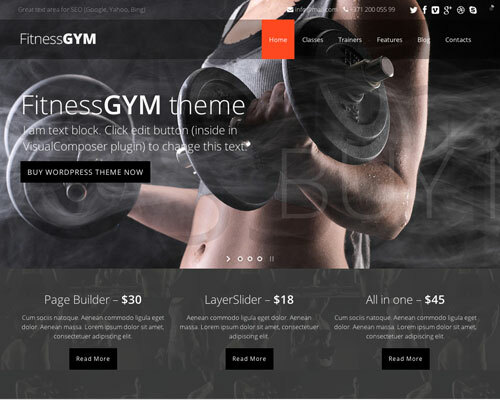 Fitness Gym comes with many powerful features such as the ability to add custom background images for each page, post or portfolio; it’s compatible with all major web browsers; lets you choose from 6 post formats (standard, image, video, gallery, quote or links) and more. Kardio features a modern sporty design that looks clean and well structured. 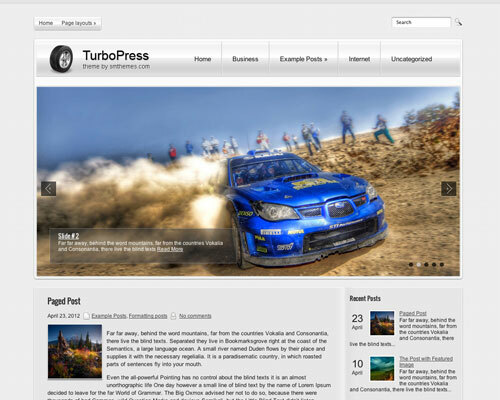 The theme comes with a contact us page, image slider, social links and more. Spa Salon features an elegant upscale design that is crisp and clean. 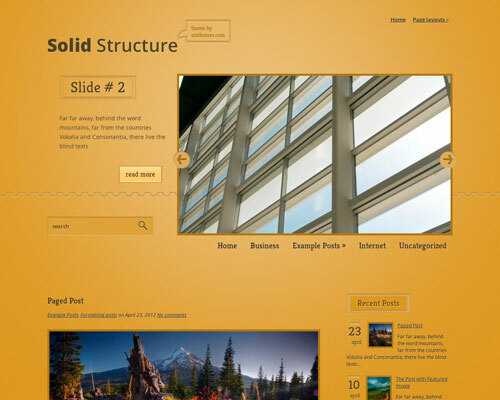 It has a right sidebar, featured slider and more. 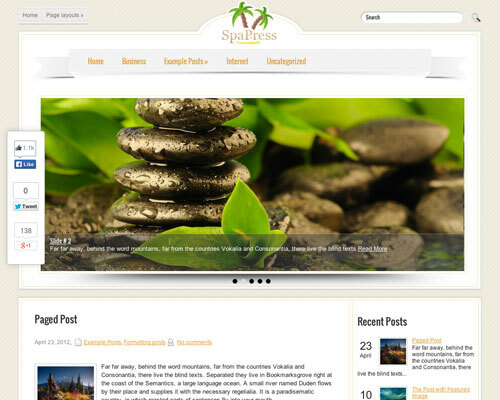 SpaPress has a nice tropical look to it that will make your visitors feel like they are in paradise. Fortunately for us, there is more to this theme than just good looks since it has shortcodes for Google maps, anti spam feature which doesn’t rely on Captcha and more. Wellness comes with 4 designs to choose from: a Yoga studio design, clinic, retreat or health practice. The theme is SEO optimized, has a request form which lets users pick a date using a calendar, is cross browser compatible and more. 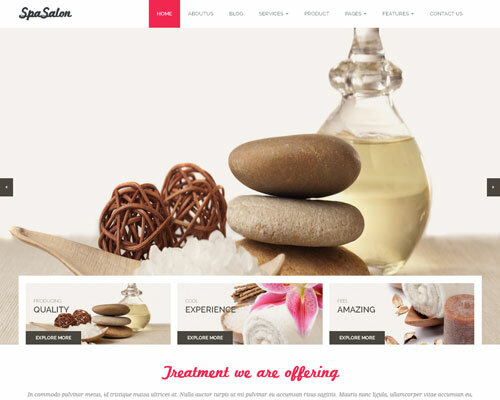 The Beauty Salon theme has been built using jQuery, CSS3 and HTML5. It has been optimized for speed and SEO, lets you choose from unlimited color combinations, has a tiled design for displaying services and more. 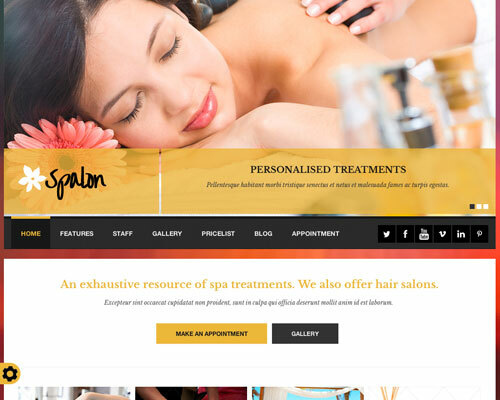 With a gold and black color combination, Spalon will be sure to give your site a professional elegant, high end look. 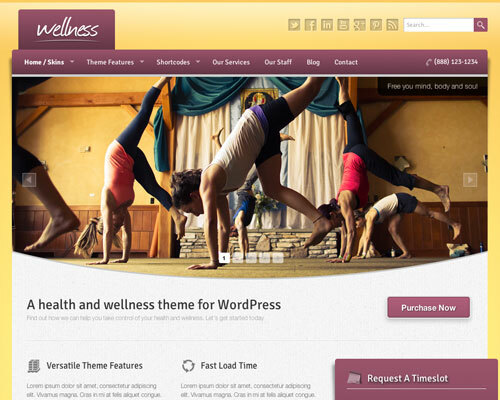 The theme features many nice options such as an appointment form; custom post types such as price list, staff, gallery, testimonials and slider; is compatible with WooCommerce and more. 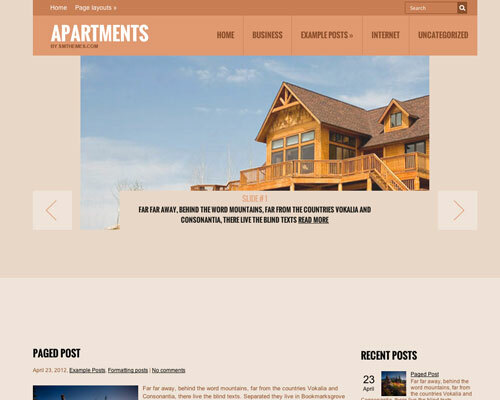 The hotel theme is perfect for either a hotel or motel with its professional design and brown color scheme. The was designed using HTML5 and offers plenty of customization options and more. 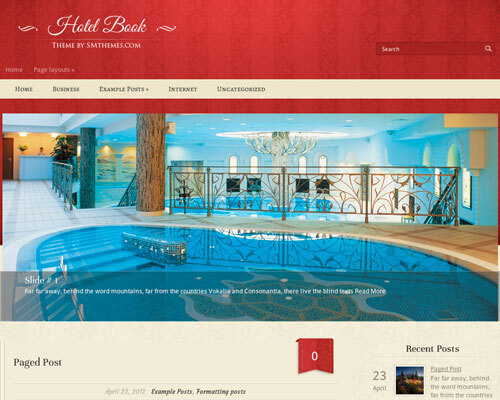 HotelBook has an elegant, luxurious look with a red and tan color combination. The background of the theme looks as though it has hotel wallpaper going across. The designers also paid close attention to detail as can be seen in the navigational bar, post’s comments indicator, read more buttons as well as other HTML elements on the pages. 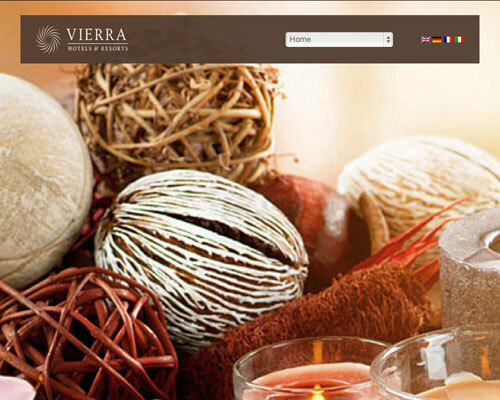 Vierra would make a great theme for any hotel or resorts website that’s looking to add a touch of class. The theme has a built-in booking form, language switcher, has been translated to 7 languages, has 3 layouts to choose from for rooms pages and more. 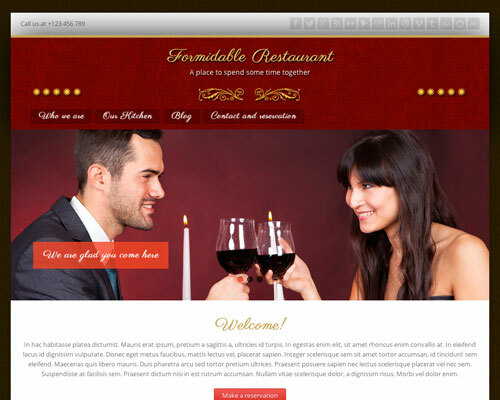 Formidable Restaurant features a red and gold color combination with an elegant font, icons and layout. Features a Flexslider for images, a portfolio layout which can be used to display a meal menu, has 5 custom widgets, 2 menu locations, social links and more. Foodeez is available as a free or premium download. 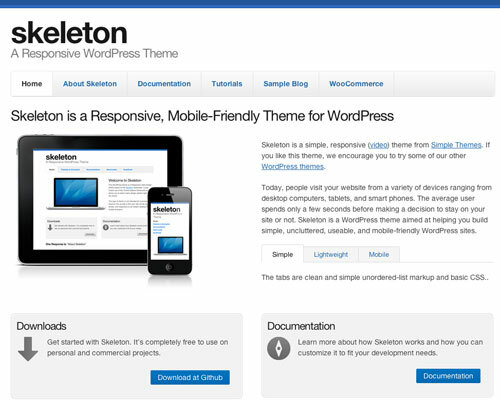 The free theme is fully responsive, lets you customize the theme with unlimited color combinations, is cross browser compatible, translation ready and more. 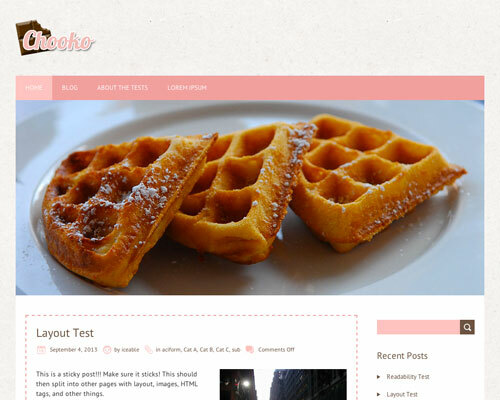 Chooko Lite is a fun yet professional looking theme that would look great on a casual food related site. 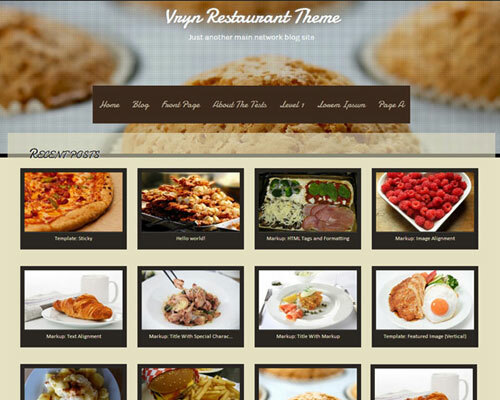 VRYN restaurant has a traditional look to it and has been derived from the famous Sixteen WordPress theme. Cooking Book has a traditional yet elegant look and has a lot of nice details such as the navigation menu which resembles a food menu as well as the image slider which which resembles a photograph with lifted edges. 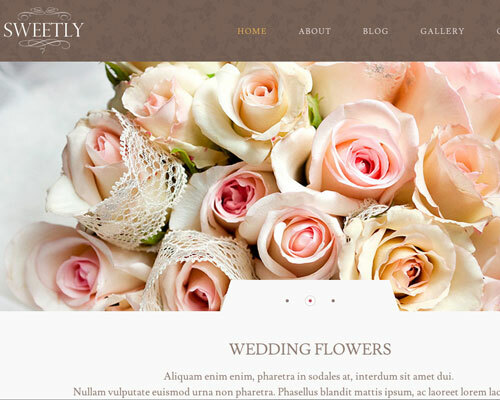 This theme would work great for an upscale restaurant or European restaurant. 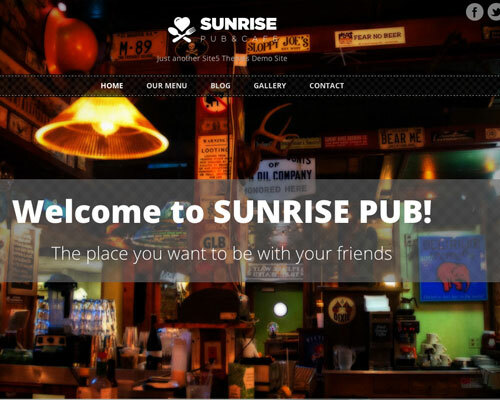 Sunrise has a modern look to it and really has a welcoming feel to it. The design is very modern and the mouse over image effects on the homepage are pretty cool and remind of turntables. The plaid orange pattern for the buttons are also a nice touch. Cefemio was built using CSS3 and HTML5, has a built in reservation form, audio player, a full background slider which makes use of the jQuery Vegas plugin and more. 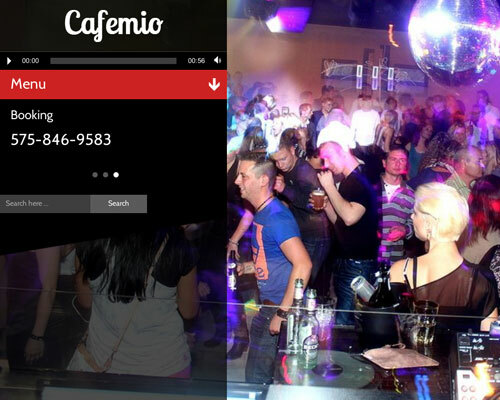 This is a great theme for clubs that are looking to give their sites a nice modern night out look. 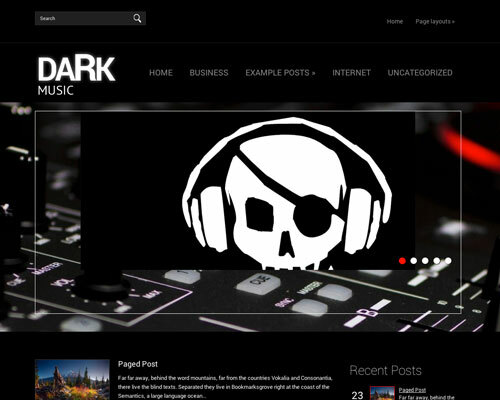 Dark Music is a black and white theme which has an underground look to it. A theme such as this one would look good on a site that advertises rock, rap, metal, alternative or similar music genres. 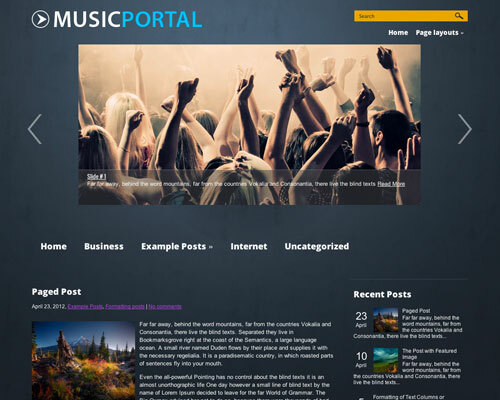 Music Portal features a dark blue background with what looks like a spotlight at the top. The overall look is modern and would look great on a site selling concert tickets or looking to show off their club music, liver performances etc. 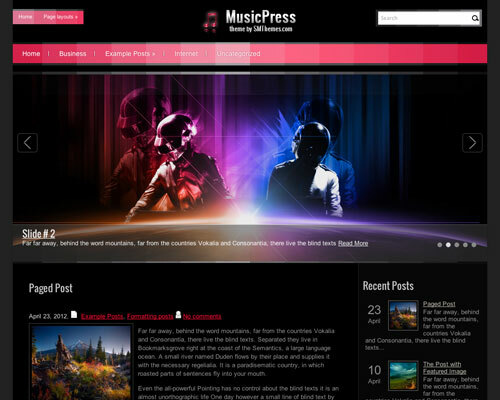 Music Press features a black and pink color combinations and has a very modern look with computer generated effects. This theme would look great on a site that is geared towards techno, house, club or similar music. 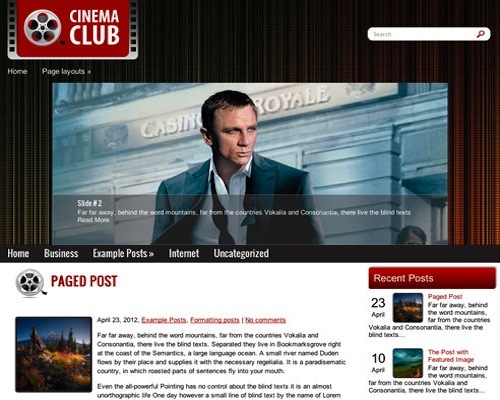 Cinema Club has a professional look and feel and really makes you feel like you are at the movies with its curtain background and film reel logo and icons. This theme would look great on a site that is looking to sell movie tickets or local movie rental store etc. Carzine has a cool blue with dark grey color scheme and a background pattern that resembles perforated leather. 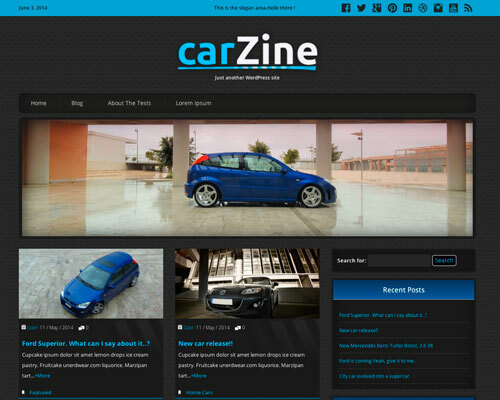 The theme would look great on a site advertising car rentals, automotive accessories, tuning etc. Here is a nice clean looking theme with a silver and gray color combination. The design would fit in wheel for a wheel shop, tuner shop etc. 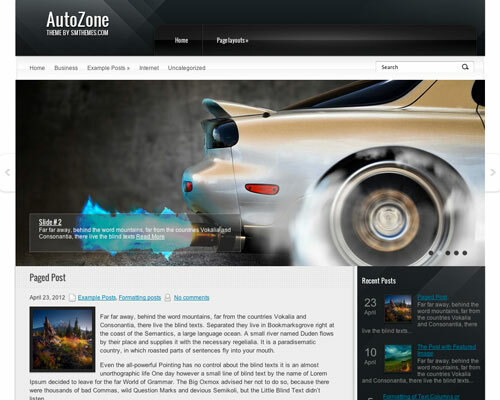 Auto Zone features a black and gray color combination which gives off a nice sporty feel. Perfect theme for a car dealership, store selling accessories and upgrade kits etc. 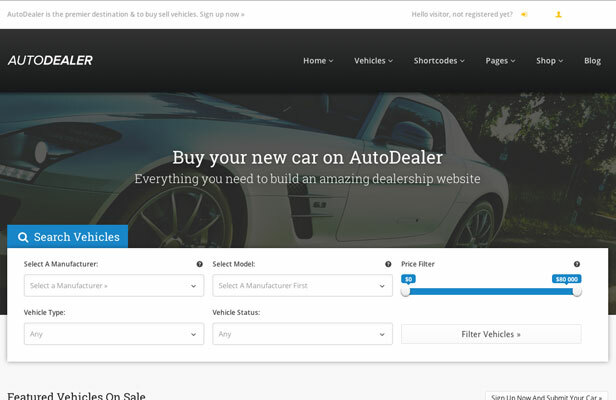 Auto Dealer offers all that is needed for a car dealership website. In addition to that, the theme can also make your site function as an automotive marketplace where users can pay to list their vehicles on your site. 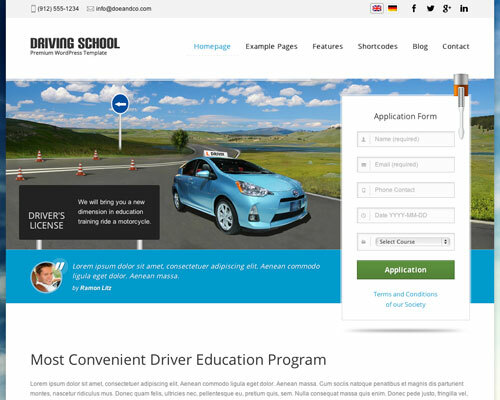 Driving school comes with a multilayer revolution slider, application form, testimonials section, price table section, it’s multilingual ready and more. 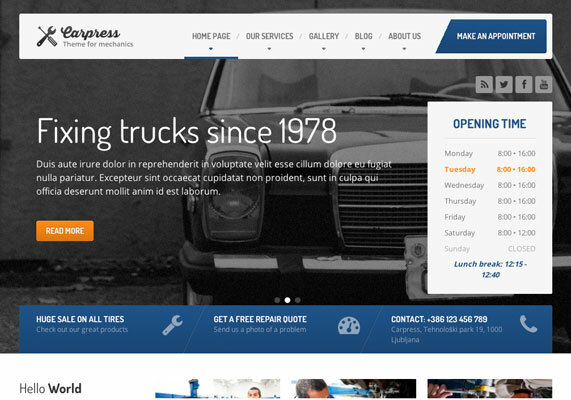 CarPress is the perfect theme for a mechanic shop since it has a section for hours of operation, a form where users can make an appointment and much more. 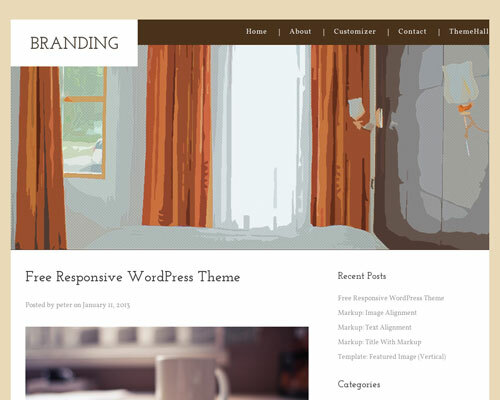 The theme is also highly customizable with unlimited colors, layouts and more. 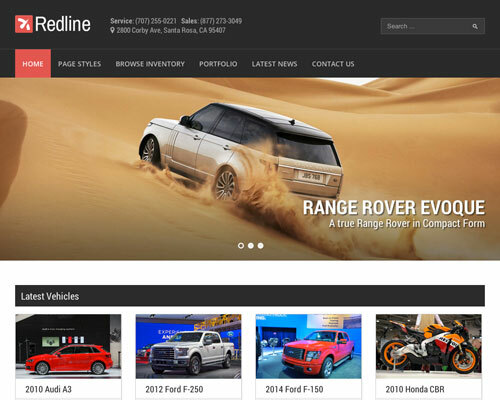 Redline provides the ability to add custom search fields, adjust vehicle specs, adjust currency, makes use of Google maps, has a request more information form and more. 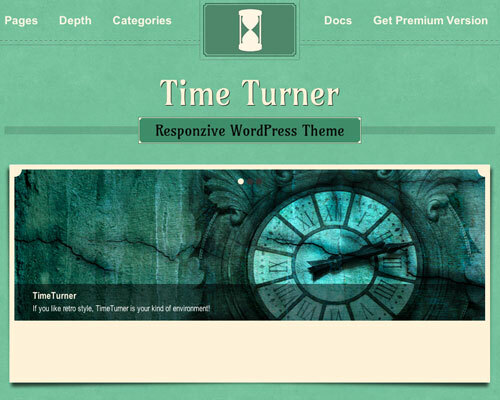 Time Tuner features a classic look and features a teal background which resembles suede leather. The theme also uses large font which makes things easily readable and it’s obvious that the design put a lot of work into designing this site judging by the close attention to detail. 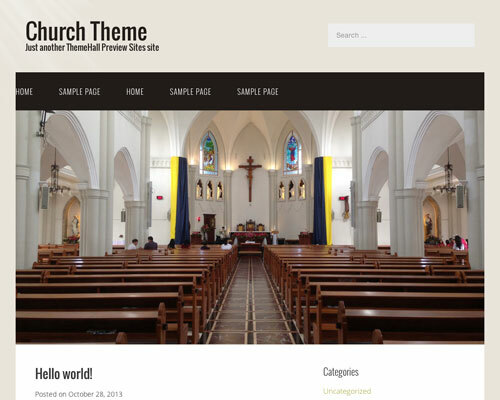 In the latest version of this theme, the designer added the ability to upload your own banner image. 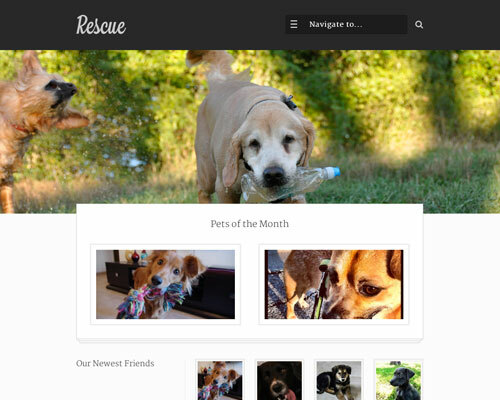 Rescue makes a great theme for an animal shelter website. The theme has a built in feature which can sync your site with the Petfinder API by simply entering in your shelter ID. Of course if you’d prefer to manually add pets or do both, you can. In addition to that, the theme has a business hours & locations widget, Google maps support and more.